OneBank3 is the latest in a long line of bank bag replacements for the default bank bags that will combine all of your bags into one frame. OneBag has a long history of minimalism and OneBank3 will continue to uphold the standard of easy of use and simplicity it's predecessors set. Like the earlier versions OneBank will continue to offer powerful options for those who wish to delve a little deeper. Also in the vein of earlier iterations I've kept to the philosophy of doing as little work as possible, as a result the code base is very small, and most of it is in the OneCore library. As of the time of writing there are only 365 lines of code unique to OneBank3, and only 1804 lines of code in OneCore itself. LoC is a horrible stat in general, but it's fun none the less, and I cheat horribly since I build off the powerful Ace3 libraries. 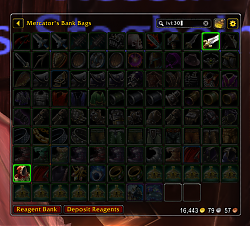 Combines all of your bank bags into one. Inherent support for addons that interact with the default bags. Color coded slots by item rarity or bag type. Allows only certain bags to be displayed, either by slot or type. Custom bag bar which will highlight it's associated slots on mouseover. This highlighting can be locked in place by clicking. Integrated purchasing of bag slots. Customizable scale, background color, alpha, and more. Clean and powerful graphical configuration. Search inside of OneBank3 is powered by the LibItemSearch library by Jalibroc. As a result it supports many advanced search options. Logical NOT: "!q:epic" matches items that are NOT epic. Logical OR: "q:epic | q:rare" matches items that are either epic OR rare. Logical AND: "q:epic & t:weapon" matches items that are epic AND weapons. Greater Than: "lvl: > 30" matches items that are higher than level 30. Less Than: "lvl: < 30" matches items that are less than level 30. Greater or Equal to: "lvl: => 30" matches items that are lvl 30 or greater. Lesser or Equal to: "lvl: <= 30" matches items that are lvl 30 or less. soulbound, bound, bop - Bind on pickup items. bou - Bind on use items. boe - Bind on equip items. boa - Bind on account items. quest - Quest bound items. OneBank's adventurous brother who didn't mind being dragged through a dank swamp, Bag does pretty much the exact same job for your character's bag as OneBank3 does for your bank bags. Please report all bug reports to my tracker on WowAce. I want to thank all the users who've been using OneBag and OneBank for so long. And, there's an updated version on Curse, dosen't seem to be here yet. Getting the following in 5.4 when opening bank. All slots show as empty (no icons). 3.3.10 should fix the the locale error. I am getting same error as well. Only beef I have is when you set the bank all the way to the left of the screen and you hit the arrow to open the bag window, you can't close the bags because the arrow is covered. Last edited by gjunky : 06-01-10 at 10:05 PM. Well I'm at least 1 user who's still faithfully waiting for OneView3. 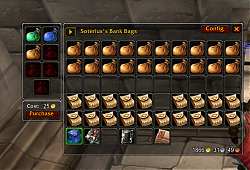 I've been using BankItems in the meantime, suits my purposes (adds who has how many of what in the tooltip), but the UI of the addon itself (when looking at another character's bank) is so ugly! OneView would be so much prettier. 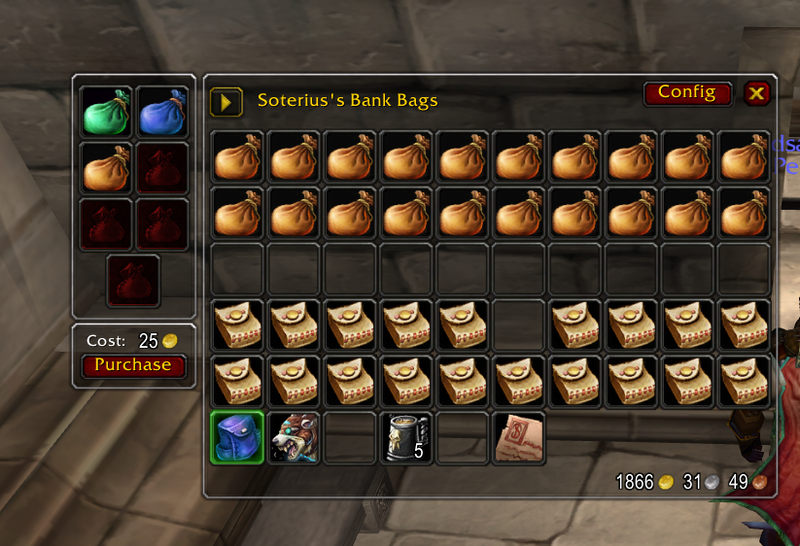 I've been slowly working on OneView3 which provides this as well as alts bank/inventory viewing. I've been so annoyed by the default bank interface since 3.0 came out. Even though it took a while to release, OneBag/Bank/View is my favorite bag collecting mod and I'd never use anything else. Love the efficiency of your mods, never change!